I just hope this is fake. 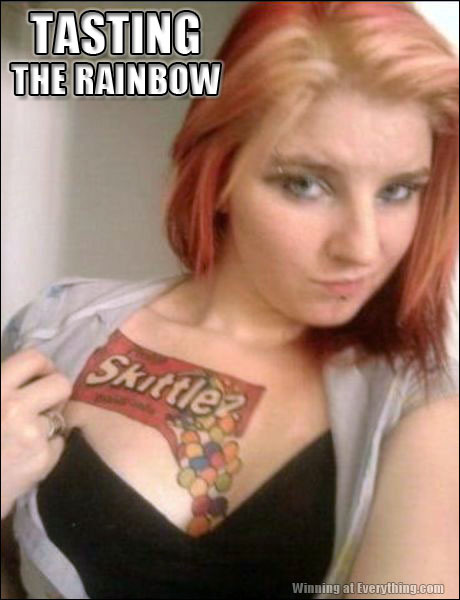 You don’t want to walk around with Skittles on your body. You might run into a George Zimmerman-type, and then that’s the end of you. Elsa – do u wanna taste a snowman? Hey, and when she gets all old and saggy, they’ll be Twizzlers! I think as long as she doesn’t pound someone’s head onto a sidewalk she’ll be safe. Ted Nugent just showed up! “Gramma – what’s a “Skittlez”? I’ve unfortunately seen Jerry Springer too many times to think this is photo shop. It matches her face and hair all too well. Yeah. Her mom must be super proud. You kiddin’? Her mom gave her the tattoo. Don’t get caught with your hand in the candy jar.